An inside look at one of Baltimore’s volunteer opportunities, Volunteering Untapped #volunbeering. Some of our team members have recently been given the opportunity to volunteer with local organizations to help restore our beloved city to all of its glory and charm. We sat down with volunteer and Observation Baltimore CEO, Barbara Gassaway, to learn more about her experiences. You have a lot of opportunities to participate in volunteer work. 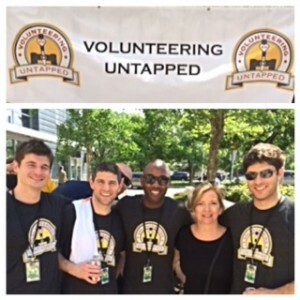 What is it about Volunteering Untapped that makes it so worthy? These young volunteer leaders are inspiring a whole new generation to give back to Baltimore. The energy and dynamic drive, coupled with the concept of networking over a beer afterwards, is only a glimpse into what makes them so unique. Please know I serve as an advisor, meaning that I am a bit over the age range of Volunteering Untapped’s key audience as the focus is directed towards younger professionals. Volunteering Untapped does not support just one local non-profit or focus all of their efforts on one goal. Rather, they work with different organizations each month. To what type of organization or cause do you feel the strongest about contributing? How can volunteers contribute to bettering this cause? I care about improving Baltimore, period. I think inspiring youth is most critical so the spirit of giving back is sustained. This is done through providing an example, mentoring, and being a role model giving back. Empowering youth to make a difference and teaching them that they are capable of leading change is the key to a successful future. As the CEO of Observation Baltimore you know all about effective leadership. What are the most effective traits you believe can be applied to or used within a volunteer organization? Employ an attitude of growing people, and always do the right thing because it is the right thing to do. Summer is just around the corner. Are there any events you are looking forward to attending or places you would like to visit around town? Preakness, baby! The national stage will shine a positive light on Baltimore Saturday. Also, as a member of the board of the Y of Central Maryland, next year we are celebrating Druid Hill’s 100th anniversary. The Y is another example of an organization who makes a difference. This entry was posted on Wednesday, May 13th, 2015 at 8:40 pm. Both comments and pings are currently closed.